Winter winds are still hanging on and chilling the air here on Cape Ann. Sun is warming up but still a bit to go before it truly feels like Spring. Yet, am grateful for the beautiful days we have. Hope we all will be able to get outside this weekend and enjoy nature. Wonder what you will be doing to creatively express yourself? 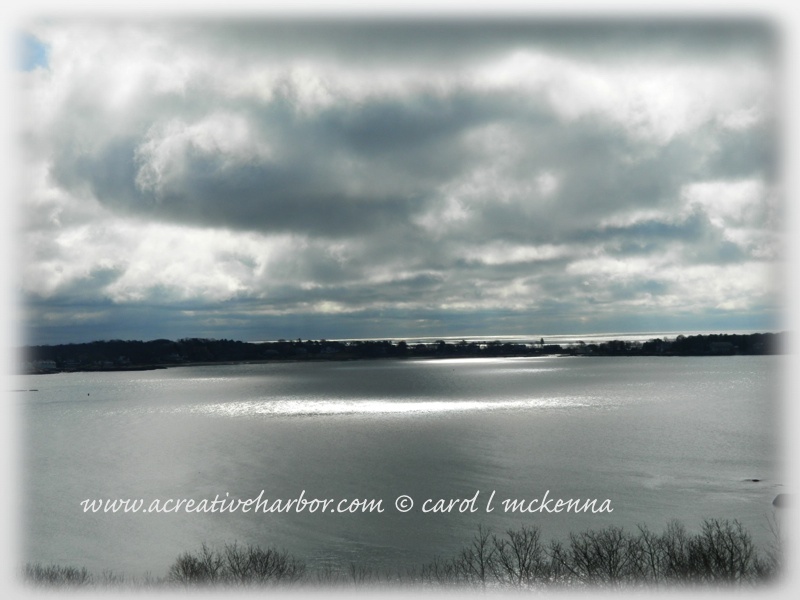 Lovely moody skies, Carol, and great captures for the day!! Hope you and ArtMuse Dog have a fun weekend! This is a lovely place to visit, so peaceful and serene in many ways, and these lovely pictures, awesome. I am enjoying nature this weekend, loving it in fact. Wishing you a great one! beautiful post and i love your sky photo. Beautiful images. My favorite is black and white. What gorgeous skies - love those seats on the cliff. Beautiful pictures, I love especially the black and white with the two benches. Makes me think of a couple in love ! Beautiful moody skies! Happy sky watching. Love your beautiful PPF piece today Carol! Hard to choose a favorite from today's selections , but if I must it's your harbor sunrise. You've really captured the feel of winter letting go to spring. Also, some wise words in your haiku mosaic. A question for you Carol- notice that you sometimes combine several different memes in one post. Do your readers appreciate that approach? I think its important to comment as well as post, but find it hard to visit a lot of my blogger friends every day. Instead, I try to read all their entries for the week and comment. I'm just trying to decide whether to do a combined post on a weekly basis or still use the daily/several times a week approach. Your thoughts? i love the soft seaside skies but the black and white was awesome. What a lovely soothing painting! and your photos are just beautiful! Happy PPF! Love the 'Ku, as always. 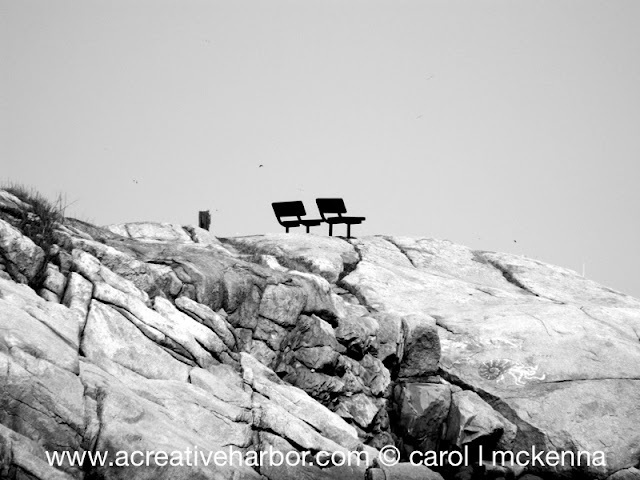 And I LOVE the shot of the benches on the rocks. Wonderful stuff. I really like the b&w image and the last one. Good stuff! Love the skies over Cape Ann! 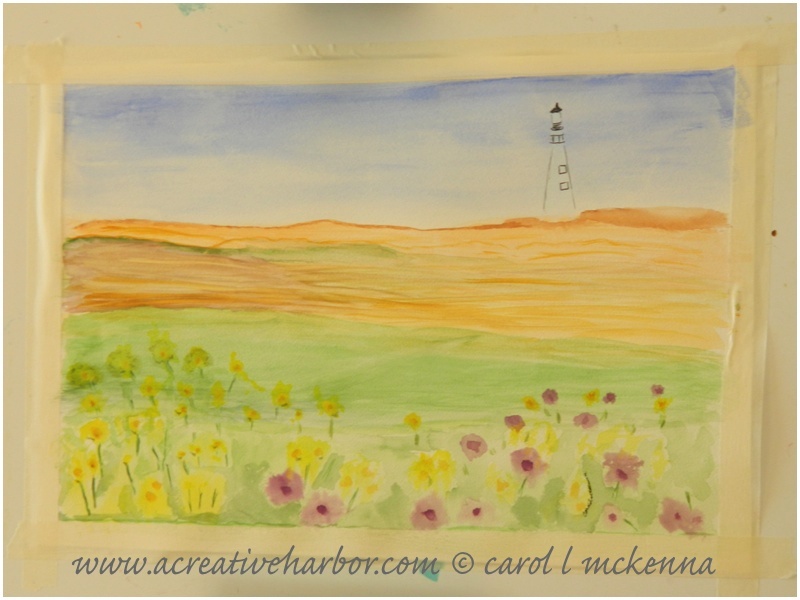 I like that you put a lighthouse in your painting. Like the quote too. A wisp of saddness running through your haiku today Carol. I hope everything will be okay. Love your piece Carol. Soft colors all around. The flowers are just beautiful. Enjoyed your Haiku's. Thank you. Wow Carol..loving your watercolor and ink..stunning..uplifting..gorgeous feeling of freedom..love the spaciousness and tiny flowers..beautifully done! and I absolutely an struck by your black and white piece..inspiring...magical and breathtaking! Carol, here's hoping that nature did heal. Hugs! What gorgeous late winter/early spring scenes. Love the sky! 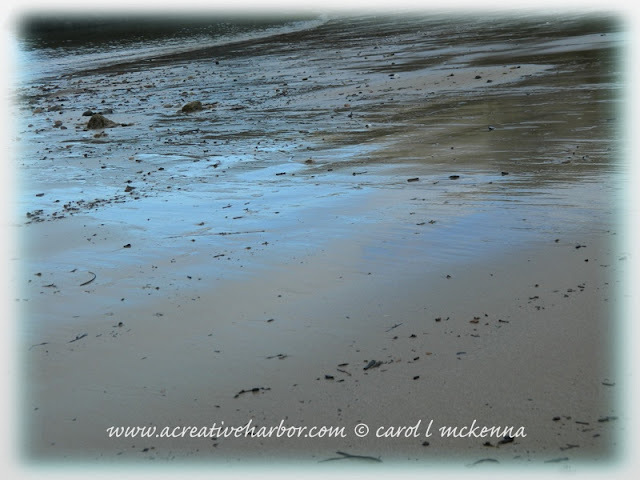 your photos and art and haikus are always so soothing Carol. I really love any scape that is at a lake or the ocean. Beautiful! Thanks for stopping by my blog too. Happy PPF! Lovely landscapes! Makes me want to have a vacation right now! beautiful photos and love your painting with the wonderful spring flowers. Carol your photos are so lovely, especially that last one, wow! I love how you captured the light in it, very magical! Beautiful paintings and photos, thanks for the inspiration! HPPF! 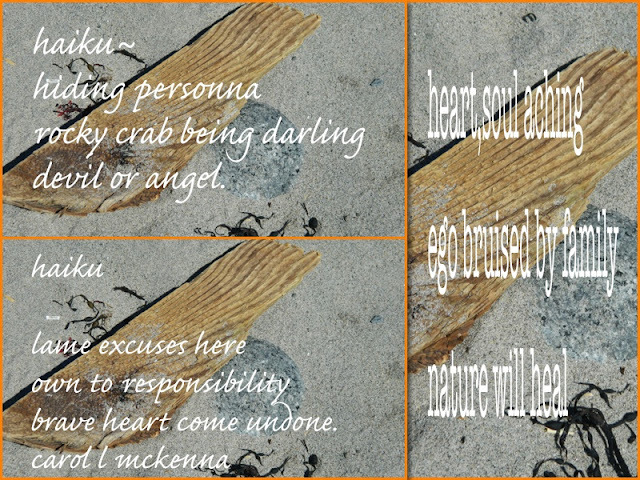 Wow your photos are awesome and the haiku piece is haunting, a magical post. what a lovely peaceful landscape painting! The haikus are very heartfelt and personal - almost like confession? Wonderful post! Beautiful photos and words as always! We had a warm spring day today, finally! I'll send it your way!! Bless the healing of nature! Beautiful art, photography and words. nature is one of my favorite healers. thank you carol for sharing so many beautiful views into the world at your finger tips. i hope your weekend will be warm and inspiring. Love your watercolor and ink. Thanks for sharing your very creative self. You always seem to evoke some sort of emotion with your posts. I don't know why but I always find images of empty seats quite melancholy. There you are... you've done it again. :-) Fabulous. The bench looks so lonely, but you know someone will come to visit soon. Hi! Nice painting and beautiful photos and affectingly Haiku. I reminded of a Japanese poem, "I am bathed in tears to the islet beach and play with a crab." The meaning is different from your Haiku. But I felt Nature healing is almost the same. I like your black and white. Those seats contrast beautifully with the rocks. Your photos always bring joy to my heart! The sunrise over the harbor is especially beautiful. Nature is indeed the best of healers!! 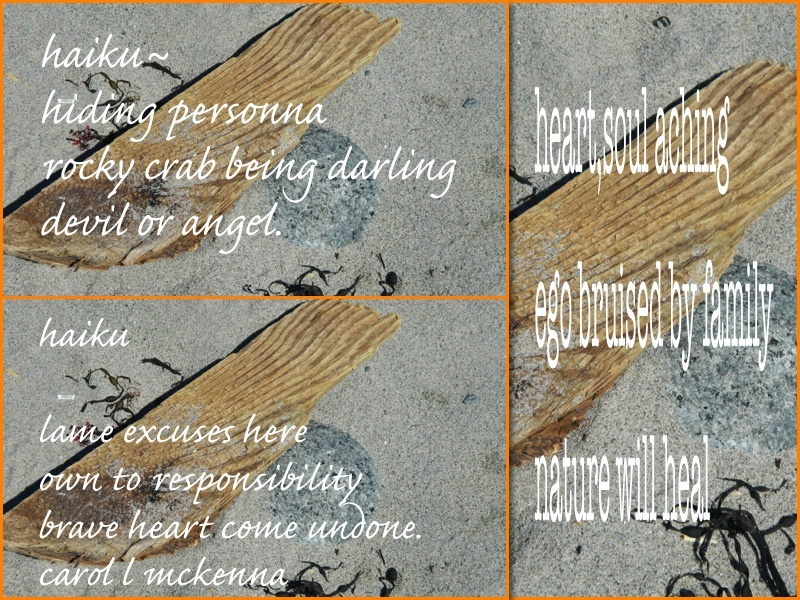 What a treat again Carol, this post is gorgeous and I like the haiku very much. Absolutely beautiful pictures ...the black and white one is my favorite...very romantic ! I like the solitude and invitation to reflection the B&W benches convey! 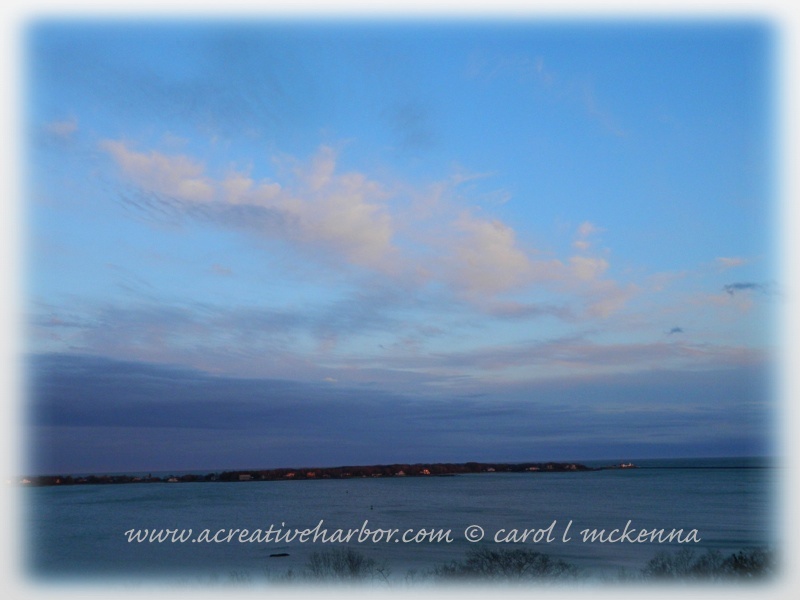 The Cape Ann Harbour sky is beautiful! Thanks for visiting and kind comment! These are some great shots.